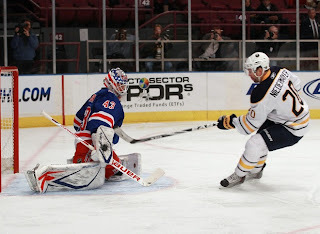 Thursday night's game against the Buffalo Sabres presented a golden opportunity for the Rangers to finally win a game at home for the first time in this third game of a 4 game home stand. Their upstate opponents, not the free skating talented team of recent years, had played an overtime game the night before in Newark. This was one of those games that the Rangers should get and need to get when they are home. However, this game would see an injury depleted roster for both teams, which has become a staple of the Rangers' season so far. On the positive side, the Blueshirts were welcoming back Marian Gaborik for his first game since the opener, while on the infirmary side, Michal Roszival (shoulder) and Henrik Lundqvist (stomach flu) would be sitting. Ryan Miller, the Sabres' Olympic goalie, was out with a knee injury and would be replaced by Jhonas Enroth, who had beaten the Devils the night before. With Marty Biron in goal for his second start this week (he lost 2-0 on Sunday to the Blues), this was a chance for him to put to rest any doubts that he cannot spell Henrik for as many as a dozen or more games this season. As it turned out, the Rangers did not miss a chance to get 2 points at home and Biron erased significant doubts about his ability as he played a sterling game to lead the Rangers to a thrilling 3-2 overtime win. Official recap is here. goal, an assist and a waved off goal besides being a strong presence on the ice. Besides Biron, the Russian contingent of Artem Anisimov and Ruslan Fedotenko provided the scoring needed to secure the win. Fedotenko got the Rangers' initial score in the first period while Anisimov scored a goal in the final minute of the second period and then snapped in the game winner with 3:28 remaining in overtime. The Rangers took the lead in the first period after the Rangers failed to capitalize on 2 power play advantages. However, the Rangers maintained their pressure after the second one expired leading to Fedotenko slipping the puck under Enroth after the goalie could not control a rebound. Christopher Higgins Redux? Frolov cannot buy a goal right now. Alex Frolov, although snakebitten again, seemed rejuvenated and had a bounce in his step that suggested that he and Gaborik are going to team up well. Near the end of the period, he had 2 quality chances that he could not put home, yet again. But you can sense that the goals are about to come. 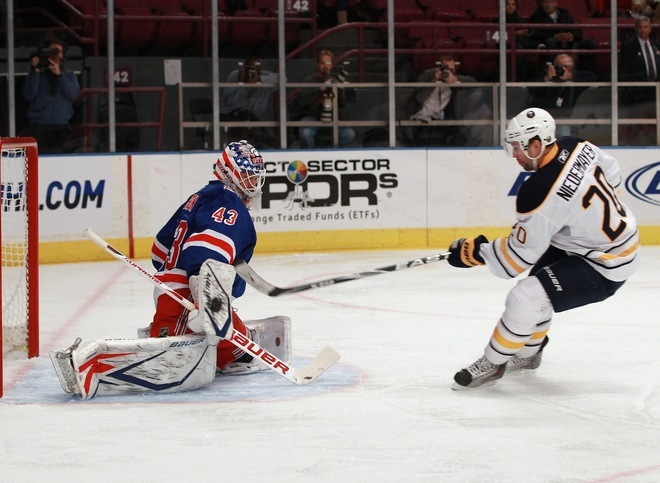 The Rangers outshot the Sabres 14-8 and should have had more goals. The second period started with the Rangers pressuring Buffalo led by Brian Boyle and Brandon Prust in an attempt to extend the lead. But eventually, the Sabres took control as Tim Connolly had 2 great chances in the first 3 minutes. 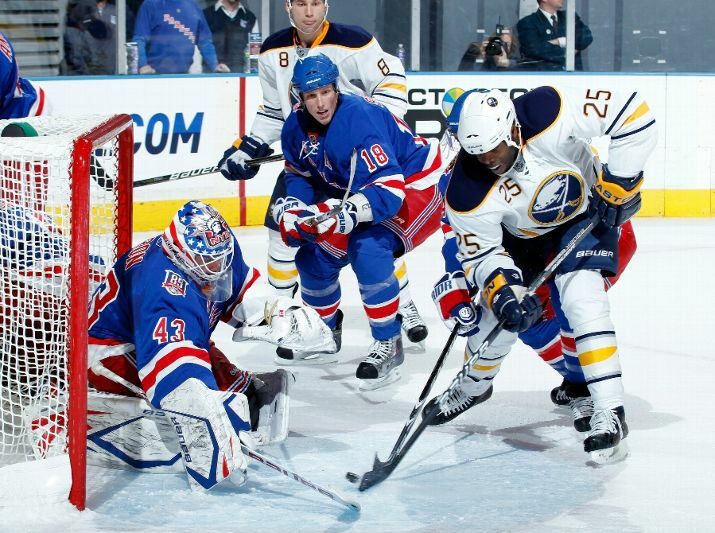 Biron was sharp for the most part and he had to be as the Sabres outshot the Rangers 12-4. He robbed Neidemayer by stretching across the net to stop his shot. Later Andrej Sikera sprang Thomas Vanek on a long pass; Biron blocked the shot but he ended up on his side. Tyler Ennis, duplicating Fedotenko's score, jammed the puck home under the prone Biron to tie the game at 1.
back of the net on several occasions. It was another game that the Rangers scored late in a period, including their recent win in Toronto. And it was an opportunistic goal since it came on only the Rangers' 4th shot of the period. and an unimpeded approach to the net to tie the with less than 3 seconds. 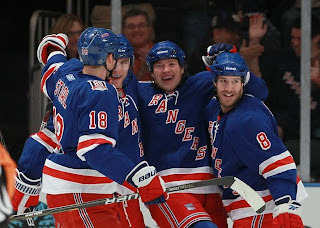 However, following a pattern of the past couple of seasons, the final minute of a period can be dicey for the Rangers. This game was no different as Buffalo immediately took the puck into the Rangers' end. The Rangers simply could not clear it out of the zone and you could see Rangers gliding around waiting for the horn to sound. Dan Girardi was a guilty party as he slowly chased the puck into the corner but Cody McCormick of the Sabres got to it first and found Rob Niedermayer who saw that Mike Grier had inside position on Ryan Callahan in front of Biron. Grier took a nifty pass across the crease and slipped the puck into the net with 2.9 seconds left to tie the score. 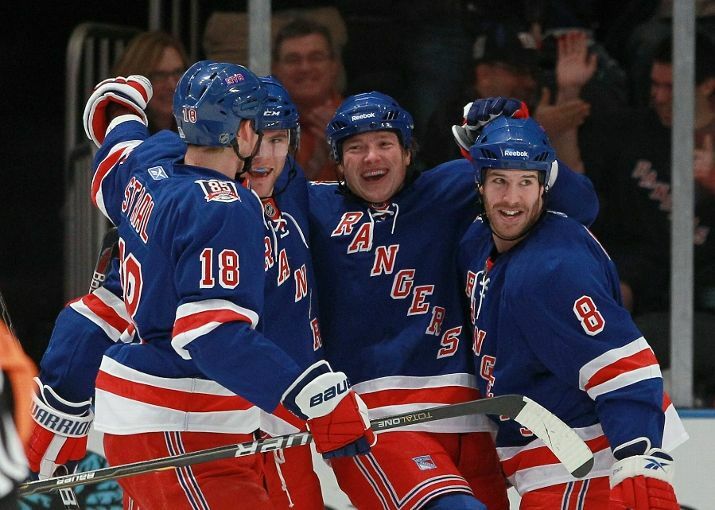 For the third period, the Rangers came out of the locker room and dominated. The Sabres were likely weary at this point after their long game the night before. Gilroy pushed the puck up the ice several times. Fedetenko scored what should have been the Rangers' goal but it was inexplicably waved off just 4 minutes into the period. Replays showed that the puck was in the back of the net before the whistle blew. Why the goal was not reviewed is also inexplicable. For one of the first times this season, Tortorella went ballistic on the bench and rightly so as this was the second goal waved off during the homestand on questionable grounds. Two minutes later, the Rangers almost were in deep trouble as Hecht beat Biron on a wraparound but somehow Biron kept the puck out of the net, it bounced off Biron's pad and then the knob of his stick prevented it from rolling into the net. Fortunately, Eric Christensen swooped in to clear the puck away. came in from the left to sweep away the puck into the corner to preserve the tie. The rest of the period saw some great end-to-end play. Biron stopped Vanek's terrific try for score, the Rangers immediately skated up ice and Callahan made a beautiful pass to Dubinsky whose one-timer was stopped by Enroth with 11:25 left. Christensen, Gaborik and Frolov meshed well during the third period but Frolov continued to be unable to convert his chances. Avery, Steve Eminger and Derek Stepan wreaked havoc with forechecking for a couple of shifts in the Sabre zone keeping Buffalo bottled up. Regulation ended tied and so it was the third consecutive OT game for Buffalo. 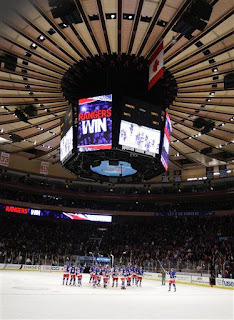 In the extra stanza, the Rangers were able to get an unusual win in overtime. Believe it or not, the game winning play started with a terrible turnover by Christensen outside the blue line. Vanek was stopped again by Biron and the Rangers rushed up ice. Anisimov was stopped on his first shot at Enroth but the puck stayed in the zone. Fedontenko (who played perhaps his overall Ranger game) went into the corner to retrieve and sent it to Girardi at the blue line. He shot the puck toward the net, Anisimov's attempt was blocked but he immediately pounced on it, settled it and turning around, he shot a laser that beat Enroth high over his left glove hand with 3:28 remaining for the win. Answer to Frolov's scoring woes? Welcome Back, Marian. Once again the Rangers showed their resiliency -- they shook off the loss of Roszival and Lundqvist. They did not allow Buffalo's tying goal at the end of the 2nd period to destroy their confidence. They ignored another waved off goal and just plugged away. Winning this game was important because the idea of losing a third game in a row at home would mean that the Rangers had squandered a possible 6 points. 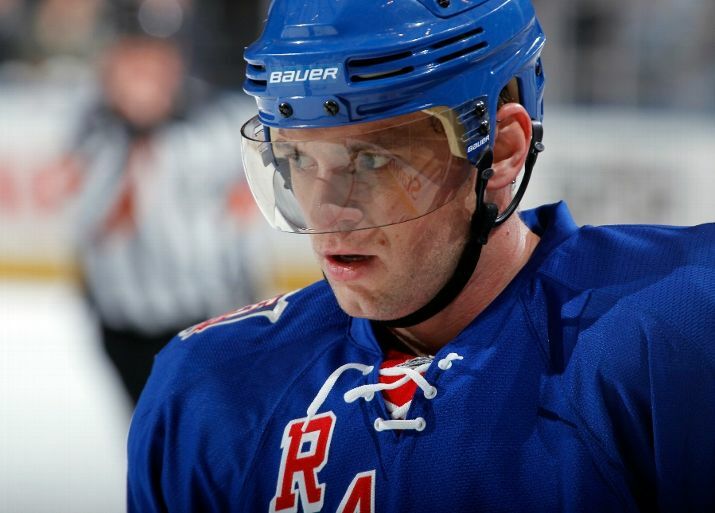 Marian Gaborik's speed was evident as the Rangers often rushed up ice with a quickness that has been missing. With Roszival out, other defensemen stepped up -- Eminger and Sauer had good games. Sauer seems to be getting more comfortable on his shifts and is not shy to hit some people. He tangled with Paul Gaustad in the second period. Later, he boarded Patrick Kaleta (and somewhere Paul Mara did a fist pump) and drew a penalty for it. Kaleta was a bit groggy and some Sabres considered revenge against anyone in a blue shirt. But nothing developed and the game went on. Gilroy, the beneficiary of Roszival's injury, certainly looked like his hiatus helped him as he had a better sense of what he should be doing out there. One thing that has become evident recently is that fans are warming to the team. They are enjoying the team's lunchpail work ethic, their resiliency, their work in the corners and the payoff of a youth movement. Fans I have corresponded with keep saying how much more entertaining the team is from recent seasons, especially the last two. Coach John Tortorella has maintained a quieter demeanor so far on the bench and in public. He has publicly praised his players (Roszival being a noteworthy example) and shared the advice he and his coaches have told players (Christensen) and what is expected of them to be contributor to the team. He has not fought with beat reporters, who have actually tried not to bait him this year. It seems everyone is more interested in how the team is developing. 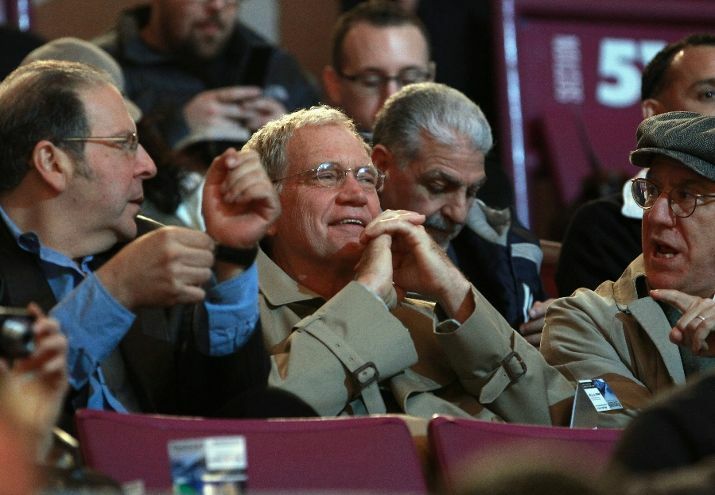 David Letterman learning to his dismay that the Rangers do not have Ice Girls for him to pursue. Later he told his crew that was the last time he would accept text messages from Brett Favre. Interesting that Tortorella has taken more of a mentor role instead of the harsh parent. Perhaps he recognizes how hard they play and how hard they are trying to buy into his system. Perhaps he realizes that he will lose the team because they have been without Gaborik, Prospal and Drury for the entire season. With Gaborik's return, the level of talent should rise and the competition for ice time will increase. That can only be a good thing for the Rangers. 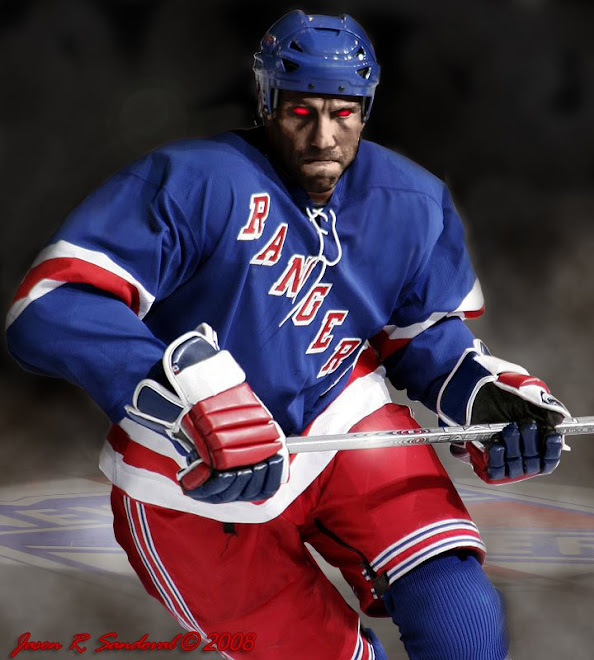 But sunday:Finnally a good game where the rangers are starting to watch each others backe on a regular bases.Carp is right Smid was looking right at avery when the fight started.What was with fraser going after Dubi? Glad to see Boogie win the first fight with some bombs second one was a draw more wrestling. I wish boogie would go after some other players besides just the heavyweights.Especially since everyone except Chara is smaller than him. I would have loved to see him go with stortini or other players like him. Boogie you are allowed,really! !lol Christianson needs a blanket party in the dressing room for saying anything bad about Avery.What a pansie he is and I wish the'd dump him,one good game for every 15 bad ones he should be gone.